To keep such a romance to himself was beyond the powers of Mr. Chalk. The captain had made no conditions as to secrecy, and he therefore considered himself free to indulge in hints to his two greatest friends, which caused those gentlemen to entertain some doubts as to his sanity. Mr. Robert Stobell, whose work as a contractor had left a permanent and unmistakable mark upon Binchester, became imbued with a hazy idea that Mr. Chalk had invented a new process of making large diamonds. Mr. Jasper Tredgold, on the other hand, arrived at the conclusion that a highly respectable burglar was offering for some reason to share his loot with him. 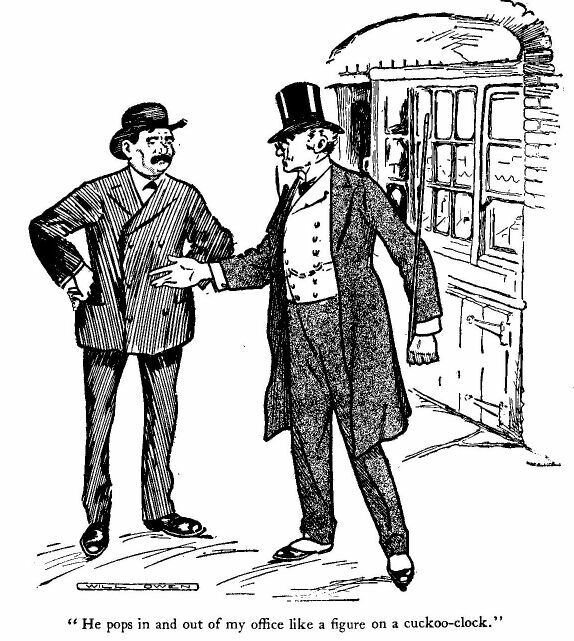 A conversation between Messrs. Stobell and Tredgold in the High Street only made matters more complicated. "Chalk always was fond of making mysteries of things," complained Mr. Tredgold. Mr. Stobell, whose habit was taciturn and ruminative, fixed his dull brown eyes on the ground and thought it over. "I believe it's all my eye and Betty Martin," he said, at length, quoting a saying which had been used in his family as an expression of disbelief since the time of his great-grandmother. "He comes in to see me when I'm hard at work and drops hints," pursued his friend. "When I stop to pick'em up, out he goes. Yesterday he came in and asked me what I thought of a man who wouldn't break his word for half a million. Half a million, mind you! I just asked him who it was, and out he went again. He pops in and out of my office like a figure on a cuckoo-clock." Mr. Stobell relapsed into thought again, but no gleam of expression disturbed the lines of his heavy face; Mr. Tredgold, whose sharp, alert features bred more confidence in his own clients than those of other people, waited impatiently. "He knows something that we don't," said Mr. Stobell, at last; "that's what it is." Mr. Tredgold, who was too used to his friend's mental processes to quarrel with them, assented. "He's coming round to smoke a pipe with me to-morrow night," he said, briskly, as he turned to cross the road to his office. "You come too, and we'll get it out of him. If Chalk can keep a secret he has altered, that's all I can say." 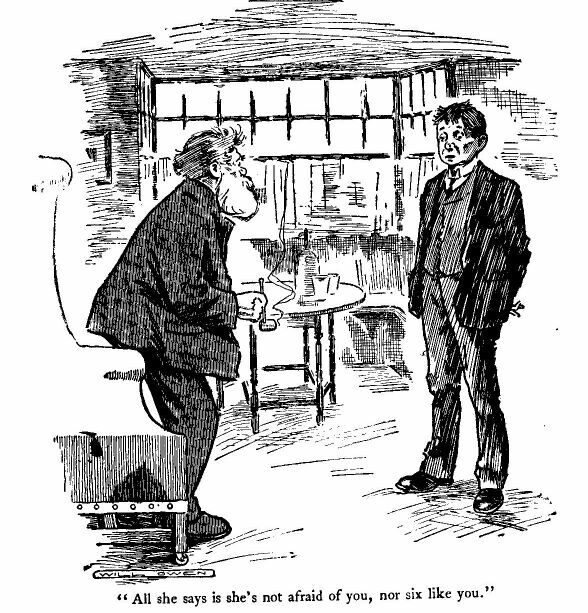 His estimate of Mr. Chalk proved correct. 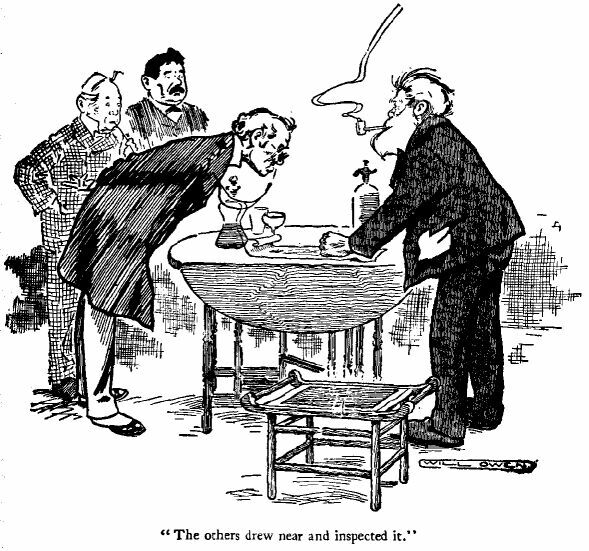 With Mr. Tredgold acting as cross-examining counsel and Mr. Stobell enacting the part of a partial and overbearing judge, Mr. Chalk, after a display of fortitude which surprised himself almost as much as it irritated his friends, parted with his news and sat smiling with gratification at their growing excitement. "Half a million, and he won't go for it?" ejaculated Mr. Tredgold. "The man must be mad." "No; he passed his word and he won't break it," said Mr. Chalk. "The captain's word is his bond, and I honour him for it. I can quite understand it." Mr. Tredgold shrugged his shoulders and glanced at Mr. Stobell; that gentleman, after due deliberation, gave an assenting nod. "He can't get at it, that's the long and short of it," said Mr. Tredgold, after a pause. "He had to leave it behind when he was rescued, or else risk losing it by telling the men who rescued him about it, and he's had no opportunity since. It wants money to take a ship out there and get it, and he doesn't see his way quite clear. He'll have it fast enough when he gets a chance. If not, why did he make that map?" Mr. Chalk shook his head, and remarked mysteriously that the captain had his reasons. Mr. Tredgold relapsed into silence, and for some time the only sound audible came from a briar-pipe which Mr. Stobell ought to have thrown away some years before. "Have you given up that idea of a yachting cruise of yours, Chalk?" demanded Mr. Tredgold, turning on him suddenly. "No," was the reply. "I was talking about it to Captain Bowers only the other day. That's how I got to hear of the treasure." Mr. Tredgold started and gave a significant glance at Mr. Stobell. In return he got a wink which that gentleman kept for moments of mental confusion. "What did the captain tell you for?" pursued Mr. Tredgold, returning to Mr. Chalk. "He wanted you to make an offer. He hasn't got the money for such an expedition; you have. The yarn about passing his word was so that you shouldn't open your mouth too wide. You were to do the persuading, and then he could make his own terms. Do you see? Why, it's as plain as A B C."
"Plain as the alphabet," said Mr. Stobell, almost chidingly. Mr. Chalk gasped and looked from one to the other. "I should like to have a chat with the captain about it," continued Mr. Tredgold, slowly and impressively. "I'm a business man and I could put it on a business footing. It's a big risk, of course; all those things are . . . but if we went shares . . . if we found the money——"
He broke off and, filling his pipe slowly, gazed in deep thought at the wall. His friends waited expectantly. "Combine business with pleasure," resumed Mr. Tredgold, lighting his pipe; "sea-air . . . change . . . blow away the cobwebs . . . experience for Edward to be left alone. What do you think, Stobell?" he added, turning suddenly. Mr. Stobell gripped the arms of his chair in his huge hands and drew his bulky figure to a more upright position. "What do you mean by combining business with pleasure?" he said, eyeing him with dull suspicion. "Chalk is set on a trip for the love of it," explained Mr. Tredgold. "If we take on the contract, he ought to pay a bigger share, then," said the other, firmly. "Perhaps he will," said Tredgold, hastily. Mr. Stobell pondered again and, slightly raising one hand, indicated that he was in the throes of another idea and did not wish to be disturbed. "You said it would be experience for Edward to be left alone," he said, accusingly. "I did," was the reply. "You ought to pay more, too, then," declared the contractor, "because it's serving of your ends as well." "We can't split straws," exclaimed Tredgold, impatiently. "If the captain consents we three will find the money and divide our portion, whatever it is, equally." Mr. Chalk, who had been in the clouds during this discussion, came back to earth again. "If he consents," he said, sadly; "but he won't." "Well, he can only, refuse," said Mr. Tredgold; "and, anyway, we'll have the first refusal. Things like that soon get about. What do you say to a stroll? I can think better while I'm walking." His friends assenting, they put on their hats and sallied forth. That they should stroll in the direction of Dialstone Lane surprised neither of them. Mr. Tredgold leading, they went round by the church, and that gentleman paused so long to admire the architecture that Mr. Stobell got restless. "You've seen it before, Tredgold," he said, shortly. "It's a fine old building," said the other. "Binchester ought to be proud of it. Why, here we are at Captain Bowers's!" "The house has been next to the church for a couple o' hundred years," retorted his friend. "Let's go in," said Mr. Tredgold. "Strike while the iron's hot. At any rate," he concluded, as Mr. Chalk voiced feeble objections, "we can see how the land lies." He knocked at the door and then, stepping aside, left Mr. Chalk to lead the way in. Captain Bowers, who was sitting with Prudence, looked up at their entrance, and putting down his newspaper extended a hearty welcome. "Chalk didn't like to pass without looking in," said Mr. Tredgold, "and I haven't seen you for some time. You know Stobell?" The captain nodded, and Mr. Chalk, pale with excitement, accepted his accustomed pipe from the hands of Miss Drewitt and sat nervously awaiting events. Mr. Tasker set out the whisky, and, Miss Drewitt avowing a fondness for smoke in other people, a comfortable haze soon filled the room. Mr. Tredgold, with a significant glance at Mr. Chalk, said that it reminded him of a sea-fog. It only reminded Mr. Chalk, however, of a smoky chimney from which he had once suffered, and he at once entered into minute details. The theme was an inspiriting one, and before Mr. Tredgold could hark back to the sea again Mr. Stobell was discoursing, almost eloquently for him, upon drains. From drains to the shortcomings of the district council they progressed by natural and easy stages, and it was not until Miss Drewitt had withdrawn to the clearer atmosphere above that a sudden ominous silence ensued, which Mr. Chalk saw clearly he was expected to break. "I—I've been telling them some of your adventures," he said, desperately, as he glanced at the captain; "they're both interested in such things." The latter gave a slight start and glanced shrewdly at his visitors. "Aye, aye," he said, composedly. "Very interesting, some of them," murmured Mr. Tredgold. "I suppose you'll have another voyage or two before you've done? One, at any rate." "No," said the captain, "I've had my share of the sea; other men may have a turn now. There's nothing to take me out again—nothing." Mr. Tredgold coughed and murmured something about breaking off old habits too suddenly. "It's a fine career," sighed Mr. Chalk. "A manly life," said Mr. Tredgold, emphatically. "It's like every other profession, it has two sides to it," said the captain. "It is not so well paid as it should be," said the wily Tredgold, "but I suppose one gets chances of making money in outside ways sometimes." The captain assented, and told of a steward of his who had made a small fortune by selling Japanese curios to people who didn't understand them. The conversation was interesting, but extremely distasteful to a business man intent upon business. Mr. Stobell took his pipe out of his mouth and cleared his throat. "Why, you might build a hospital with it," he burst out, impatiently. "Build a hospital!" repeated the astonished captain, as Mr. Chalk bent suddenly to do up his shoelace. "Think of the orphans you could be a father to!" added Mr. Stobell, making the most of an unwonted fit of altruism. The captain looked inquiringly at Mr. Tredgold. "And widows," said Mr. Stobell, and, putting his pipe in his mouth as a sign that he had finished his remarks, gazed stolidly at the company. "Stobell must be referring to a story Chalk told us of some precious stones you buried, I think," said Mr. Tredgold, reddening. "Aren't you, Stobell?" "Of course I am," said his friend. "You know that." Captain Bowers glanced at Mr. Chalk, but that gentleman was still busy with his shoe-lace, only looking up when Mr. Tredgold, taking the bull by the horns, made the captain a plain, straightforward offer to fit out and give him the command of an expedition to recover the treasure. In a speech which included the benevolent Mr. Stobell's hospitals, widows, and orphans, he pointed out a score of reasons why the captain should consent, and wound up with a glowing picture of Miss Drewitt as the heiress of the wealthiest man in Binchester. The captain heard him patiently to an end and then shook his head. "I passed my word," he said, stiffly. Mr. Stobell took his pipe out of his mouth again to offer a little encouragement. "Tredgold has broke his word before now," he observed; "he's got quite a name for it." "But you would go out if it were not for that?" inquired Tredgold, turning a deaf ear to this remark. "Naturally," said the captain, smiling; "but, then, you see I did." Mr. Tredgold drummed with his fingers on the arms of his chair, and after a little hesitation asked as a great favour to be permitted to see the map. As an estate agent, he said, he took a professional interest in plans of all kinds. Captain Bowers rose, and in the midst of an expectant silence took the map from the bureau, and placing it on the table kept it down with his fist. The others drew near and inspected it. "Nobody but Captain Bowers has ever seen the other side," said Mr. Chalk, impressively. "Except my niece," interposed the captain. "She wanted to see it, and I trust her as I would trust myself. She thinks the same as I do about it." His stubby forefinger travelled slowly round the coast-line until, coming to the extreme south-west corner, it stopped, and a mischievous smile creased his beard. "It's buried here," he observed. "All you've got to do is to find the island and dig in that spot." Mr. Chalk laughed and shook his head as at a choice piece of waggishness. "Suppose," said Mr. Tredgold, slowly—"suppose anybody found it without your connivance, would you take your share?" "Let'em find it first," said the captain. "Yes, but would you?" inquired Mr. Chalk. Captain Bowers took up the map and returned it to its place in the bureau. "You go and find it," he said, with a genial smile. "You give us permission?" demanded Tredgold. "Certainly," grinned the captain. "I give you permission to go and dig over all the islands in the Pacific; there's a goodish number of them, and it's a fairly common shape." "It seems to me it's nobody's property," said Tredgold, slowly. "That is to say, it's anybody's that finds it. It isn't your property, Captain Bowers? You lay no claim to it?" "No, no," said the captain. "It's nothing to do with me. You go and find it," he repeated, with enjoyment. Mr. Tredgold laughed too, and his eye travelled mechanically towards the bureau. "If we do," he said, cordially, "you shall have your share." The captain thanked him and, taking up the bottle, refilled their glasses. Then, catching the dull, brooding eye of Mr. Stobell as that plain-spoken man sat in a brown study trying to separate the serious from the jocular, he drank success to their search. He was about to give vent to further pleasantries when he was stopped by the mysterious behaviour of Mr. Chalk, who, first laying a finger on his lip to ensure silence, frowned severely and nodded at the door leading to the kitchen. The other three looked in the direction indicated. The door stood half open, and the silhouette of a young woman in a large hat put the upper panels in shadow. The captain rose and, with a vigorous thrust of his foot, closed the door with a bang. "Eavesdropping," said Mr. Chalk, in a tense whisper. "There'll be a rival expedition," said the captain, falling in with his mood. "I've already warned that young woman off once. You'd better start tonight." He leaned back in his chair and surveyed the company pleasantly. Somewhat to Mr. Chalk's disappointment Mr. Tredgold began to discuss agriculture, and they were still on that theme when they rose to depart some time later. Tredgold and Chalk bade the captain a cordial good-night; but Stobell, a creature of primitive impulses, found it difficult to shake hands with him. On the way home he expressed an ardent desire to tell the captain what men of sense thought of him. The captain lit another pipe after they had gone, and for some time sat smoking and thinking over the events of the evening. Then Mr. Tasker's second infringement of discipline occurred to him, and, stretching out his hand, he rang the bell. "Has that young woman gone?" he inquired, cautiously, as Mr. Tasker appeared. "What about your articles?" demanded the captain, with sudden loudness. "What do you mean by it?" Mr. Tasker eyed him forlornly. "It ain't my fault," he said, at last. "I don't want her." "Eh?" said the other, sternly. "Don't talk nonsense. What do you have her here for, then?" "Because I can't help myself," said Mr. Tasker, desperately; "that's why. She's took a fancy to me, and, that being so, it would take more than you and me to keep 'er away." Mr. Tasker smiled wanly. "That's my reward for being steady," he said, with some bitterness; "that's what comes of having a good name in the place. I get Selina Vickers after me." "You—you must have asked her to come here in the first place," said the astonished captain. "Ask her?" repeated Mr. Tasker, with respectful scorn. "Ask her? She don't want no asking." "What does she come for, then?" inquired the other. "Me," said Mr. Tasker, brokenly. "I never dreamt o' such a thing. I was going 'er way one night—about three weeks ago, it was—and I walked with her as far as her road-Mint Street. Somehow it got put about that we were walking out. A week afterwards she saw me in Harris's, the grocer's, and waited outside for me till I come out and walked 'ome with me. After she came in the other night I found we was keeping company. To-night-tonight she got a ring out o' me, and now we're engaged." "What on earth did you give her the ring for if you don't want her?" inquired the captain, eyeing him with genuine concern. "Ah, it seems easy, sir," said the unfortunate; "but you don't know Selina. She bought the ring and said I was to pay it off a shilling a week. She took the first shilling to-night." His master sat back and regarded him in amazement. "You don't know Selina, sir," repeated Mr. Tasker, in reply to this manifestation. "She always gets her own way. Her father ain't 'it 'er mother not since Selina was seventeen. He dursent. The last time Selina went for him tooth and nail; smashed all the plates off the dresser throwing 'em at him, and ended by chasing of him up the road in his shirt-sleeves." "That was two years ago," continued Mr. Tasker; "and his spirit's quite broke. He 'as to give all his money except a shilling a week to his wife, and he's not allowed to go into pubs. If he does it's no good, because they won't serve 'im. If they do Selina goes in next morning and gives them a piece of 'er mind. She don't care who's there or what she says, and the consequence is Mr. Vickers can't get served in Binchester for love or money. That'll show you what she is." "Well, tell her I won't have her here," said the captain, rising. "Good-night." "I've told her over and over again, sir," was the reply, "and all she says is she's not afraid of you, nor six like you." The captain fell back silent, and Mr. Tasker, pausing in a respectful attitude, watched him wistfully. The captain's brows were bent in thought, and Mr. Tasker, reminding himself that crews had trembled at his nod and that all were silent when he spoke, felt a flutter of hope. "Well," said the captain, sharply, as he turned and caught sight of him, "what are you waiting there for?" Mr. Tasker drifted towards the door which led upstairs. "I—I thought you were thinking of something we could do to prevent her coming, sir," he said, slowly. "It's hard on me, because as a matter of fact——"
"I—I've 'ad my eye on another young lady for some time," concluded Mr. Tasker. He was standing on the bottom stair as he spoke, with his hand on the latch. Under the baleful stare with which the indignant captain favoured him, he closed it softly and mounted heavily to bed.